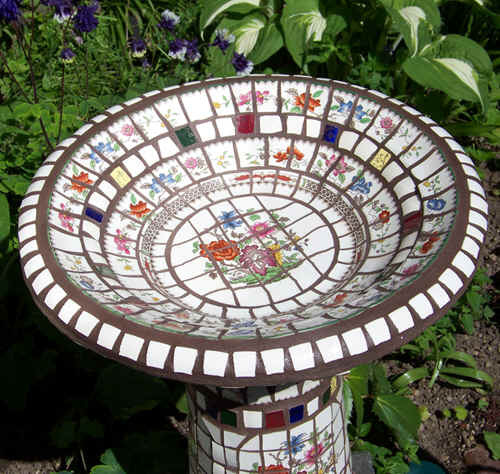 Custom mosaics are the perfect gift for weddings, birthdays, anniversaries, housewarmings and any occasion for a garden enthusiast! I enjoy doing custom creations for clients looking for a particular theme, color combination or special occasion gift. Ideas include matching colors to a garden or a home, using "souvenir" plates to remind someone a favorite place, choosing the theme of a favorite item, adding an insert into a kitchen backsplash or turning a piece of your broken china or pottery into something new. Imagine using a broken family heirloom china plate turned into jewelry for family members or bridesmaids gifts made from your wedding china pattern. The options are endless. See something on the site that is either sold or not exactly what you are looking for? Let's talk about how we can customize a piece to suit your needs or create a similar style or shape especially for you. 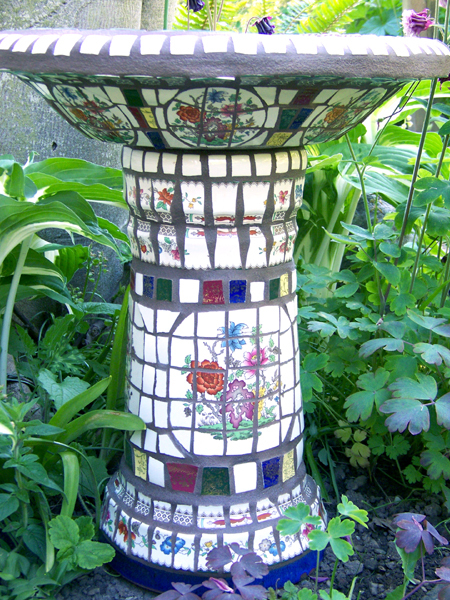 A recreated piece would be similar to, but not exactly the same as the original - grout colors, sizes, shapes, etc. can also be changed. Please note that because of the "recycled" nature of my work I may not be able to find certain pieces again, but can work with something similar. Let me know what you are looking for and we can work together to create the perfect piece. 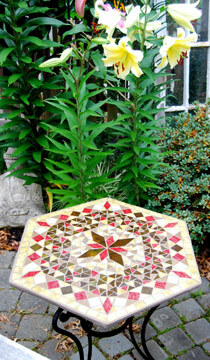 Custom mosaics can be made in a variety of shapes, sizes and materials for indoor or outdoor use. Colors, shapes and hanging options may be designed to suit your particular needs. Pricing will depend upon the size, materials and complexity of the piece. A estimate of costs will be given once we have discussed the particulars of your piece. A non-refundable deposit of 50% of the quoted price is due prior to starting a custom piece. Final payment with applicable sales tax and shipping costs will be due prior to shipment of your order. Turn around time will depend upon the size of the product, the availability of materials and scheduling. No images or text from this site may be used without express written permission.